Natural builders strive to reduce their use of cement due to high cost and adverse environmental impacts. Sustainability conscious natural builders might use ferrocement, cement plaster or micro concrete roofing tiles which use relatively small amounts of cement, and avoid more concrete intensive materials such as concrete block. Foamed lightweight concrete is another material that could be added to the list of green building materials. Granted, not every natural builder will agree and so there will likely be some healthy differences in opinion. Anyway, a reader sent me a tip about Allied Foam Tech and I thought this might make an interesting blog post. This material is lightweight, has good thermal and acoustic properties, low water uptake, fire resistance, high early and 28 day compressive strengths, freeze/thaw resistance and it’s available in a wide variety of products. It’s even floatable and can be used to make boats. “Foamed concrete or lightweight concrete derived from Allied’s aqueous foams are suitable for both precast and cast-in-place applications. Some of the highly insulative cementitious foams at densities 48 kg/m3(3 pcf) to 645 kg/m3(40 pcf) or higher can be used as block fills, lightweight roof deck and void-fill materials. Good strength characteristics with reduced weight make lightweight concrete based on Allied’s aqueous foams suitable for structural and semi-structural applications such as lightweight partitions, wall and floor panels, and lightweight blocks. Cementitious foams derived from Allied’s premium systems are suitable for thin layer coating applications where specific performance criteria are required. Foamed concrete and foamed cement made with Allied’s foam have very fine pore structure, unlike that made with conventional proteinaceous and surfactant foams. 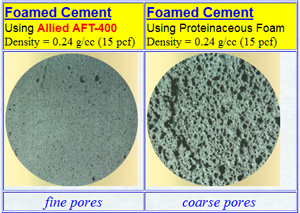 The pore structure of Allied’s foams hardly show any sign of deterioration as the density of the foamed cement decreases to below 160 kg/m3 (10 pcf). At densities below 160 kg/m3, the pore texture of foamed cement derived from conventional foam agents becomes so coarse that most of them show severe structural collapse. Here’s a related product called Biological Concrete, a magnesium phosphate cement that allows lichens, moss and other drought resistant plants to grow on the outer layer. We can make geodesic dome house from prefabricated foam concrete triangle panels assembled on site by bolts. You just need one day to assemble the dome ! Send me an email to Lstuantht@gmail.com if you are interested! Isn’t this fun…. We all are on the same team trying to figure out the secret trade formula for for Al2O3 (alumina) reacting with an alkaline, as SiO2. Those that really know are really really BIG, and do not want any small businessmen to eat into their market. If you go to my attempt to explain how truly affordable housing will happen, go to http://www.ECO-Foam-Krete.com. And, know we all need to work closely together to make this revolution work. Here is what I have learned was the Romans built structures of great strength by mixing everything of the same size. Please forget about mixing in gravel with rock. And that we will most likely will need a research department to bring together to work how our protucts will work well with a solar and fresh rainwater harvesting roof. Once again, in a few months will be shipping a totally affordable ECO building cement aftermixture, with Roman cement strong pozzilins that also contains an couple answers to the climate change problem. I plan to pour foamcrete in place for the walls of our house, and use 3″ iron pipe inside the foamcrete to provide support strength for roof attachment. I’m trying to figure out the window bucks and not having much luck. These are heavy casement windows. What can you suggest? I haven’t been able to locate any water-tight forms to rent, so we will have to make our own. Do you have plans or suggestions on that? We have contacted Allied Form Tech Corp for information about their AFT-400 foaming agent. I’ve been experimenting with Drexel FM-160. Have you used that foaming agent before, and if so, how does it compare to the AFT-400? Window bucks are easy. Just use wood. Add metal anchors to attach to the walls. You’ll probably need headers over the windows and doors to carry the load. I used 1/2″ MDO epoxy glued sign plywood for my forms- bolted together for reuse with poly weatherstripping in the joints. Oil the forms and clean them after pouring religiously . Further more form works will not costly if you use only one time. Normally formworks for cast in situ are used for new proj Xt with many repeating works. One set can be used 50-100 time depending on the material. I may have a solution if you send me drawings or picture of your project.. it is not possible to give you an advise without seeing your actual conditions. You may be interested that http://www.FoamKrete.com will soon be able, through ECO-Mining-Milling.com to supply a non-toxic PH neutral blend of a naturally soulible nano Al203 “Alumina powder” and a very solar power pure Si02 “Silica Sand fly ash” aggregriate which will be superior than coal based fly ash, and most likely will bring down the cost of AAC concrete that dosen’t come from a ECO natural blend. I discovered another video about a foam maker and he uses the Little Dragon. We can supply foaming agent which give you very resistant foam.It will never break as long as you mix it inside the cement mortar. You can mix the foam concrete all day and the foam does not collapse. May I suggest another way to achieve CLC? If you go to http://www.monolithic.org or search for them on You Tube, you will see a video of how they make Monolithic stucco. What they do is add polystyrene beads to the cement instead of aggregate and only a small amount of sand. The properties of the cement from this additive are unique. The cement won’t crack as it dries, it becomes very lightweight and has an insulation value. This my solve some of the questions on how to create CLC on a small scale. There are several places on the net listing polystyrene beads in different aggregates specifically for making CLC. What you don’t use, you can then add to your attic or make a bean bag chair. This information may help. Greentec Construction Technologies (https://greentecct.com/) is located in the US and offers molds and equipment for making cellular lightweight concrete (CLC) products. Products include blocks, panels and equipment pads. Equipment includes portable foam generators and liquid foaming agent. I have been in Foam Concrete since 1998. Our company (www.lightconcete.net) has supplied machinery and equipment for foam concrete to 12 countries around the world, including USA. I am sure I can help you in answering the questions raised by you in this forum. how to make clc Foaming agent ? what is the formulation ? I don’t know the formula. There are two kinds- one based on animal protein, and the other synthetic. You would not want to wash your dishes with either. I am only familiar with the synthetic. The shaving cream consistency bubbles hold up for many minutes before mixing with the cement, and much longer when in the cement/ water mix. I have pumped the synthetic foam/ cement mix into 6′ x 4″ poly tubes at my shop, put them in a pickup, driven 5 miles, moved the tubes and squeezed out the mix into ground squirrel tunnels an hour after the initial mix. There seemed to be no separation. I often thought pumping foam into gopher tunnels would be a good way to make them move away. Foaming agents are produced today and supplied by many company at very reasonable price. The portion of foaming agent in foam concrete production cost is less than 5%. So I think it is not worthy to set up a production unit for it if you just produce foam concrete occasionally. I supply machinery and factories for foam concrete blocks to many countries and we use many tons of foaming agent per year , but we are still buy it from other producer. They just said they use dish soap. Can you let me know how’s my m3 of foam concrete you want to produce ? I have a 55 gallon drum of foamer and can sell you some. You don’t need much to play with. It is $25 / half gallon, which would make many cu yards of foam. You want a real foamer like this so the bubbles are very small and last a long time. Such house is very comfortable due to the properties of heat and sound insulation of the concrete. You house is also earthquake and tornado resistant ! What you want for more? Can anyone direct me to a manufacturer or a set of plans to make a foam machine for CLC in the US? The link above is for a machine that makes CLC cement alone and not just a foam machine. In addition, it is overseas and when I tried to purchase the machinery it wasn’t a secure selling site. In fact I got several warnings from my Viper program. I would direct people to http://www.monolithic.org or http://www.monolithic.org/cabins. I purchased the used machinery to create these cabins, and want to make them out of CLC as they would be 1/3 lighter than normal cement. I have been looking for over a year for a small foam machine or plans to build one as the concrete is batch mixed for spraying on the inside of the domes. The CLC is lighter and would be stickier so its application would result in less fall out, but the concrete can’t be as runny as some mixes I’ve see on You Tube. I have a foam producing machine (in Mexico until June) and 50 gallons offoaming agent I bought from Goodson Associates in Denver. We used it to make foam for foam cement which I used in building a concrete house in Mexico. As I am finished with the job and did not go into the business , I still have the machine and foamer for sale. It would easily produce enough quality dense foam for any use you might have, as these machines were built to inject foam into cement into slurry pumped into large mining tunnels. The foam cement can be as stiff as you want. The foam cement hangs well on a wall when you throw it, but troweling it causes sagging. I can send more info if you are interested. I’m very interested. Where is the equipment located and what price are you asking? The foam machine was manufactured by Goodson & Associates, Denver CO. It is variable speed and can produce up to 13 gallons /minute of 2 pound stabilized foam. The foam is created continuously by injecting their A100 concentrate into a compressed air/water mix. No premixing of the foamer concentrate with water is necessary, Just hook up a water hose, compressed air, 12v electricity, and a bottle of foamer solution. It was designed to make and inject foam into a transit mixer truck, or into a stream of pumped cement slurry. The machine came with an operators manual and extensive instructions on designing foam cement mixes. The foamer mix I got with the machine is called Foamcell A-100 and creates foam that lasts 4-6 hours in the cement mix. The machine and 55 gallons of foamer concentrate cost me over $8000. I would sell it for $3500 as I have retired now and my would be partner is on to other things. It is in Mexico 6 hours south of Tucson and I could bring it back in June. I bought a Goodson A-100 foamer from a guy in CO and didn’t get any instructions. Could I PayPal you $50 to make me a copy of yours? Thanks a lot. Did you ever perfect it and find a pump? I’d like to discuss it and possibly hire you. I’m sorry Randy I couldn’t get back sooner, I’ve been in the hospital and just got out. I’ve never pursued lightweight concrete, sometimes called foamcrete for a few of reasons. There doesn’t seem to be foamers available for small jobs that don’t cost a fortune for what they do, except for the Foam Dragon and I’m unimpressed with it. There also doesn’t seem to be an availability to purchase foaming agent in smaller quantities. There doesn’t seem to be any studies on the structural strength of the concrete itself and its varying mixes. Some my disagree with these points, but I’m loath to pass my CC number to some entity overseas. There is a gentleman in Arkansas who has several videos on You Tube, “Getting Out of Babylon.” He purchased a Greed Dragon and was satisfied with it. He intends to make an interlocking block that you can grout together once you’ve assembled you structure walls. If you search You Tube for the phrase in quotes you should be able to find him. My interest isn’t in the insulative capabilities, but the light weight. I want to build a Monolithic cabin, http://www.monolithic.org/cabin which are portable. I’d like to decrease the weight by 20% over normal concrete. It would make the structures much easier to move. We simply don’t have the cranes here to move a 24 ft. cabin. Good point about the lack of testing and various other uncertainties. This field is growing rapidly, at least in Europe, and so we can expect more competitors and more options in the future. You’re correct on that. I am concerned that if you don’t get the mix correct, the structural integrity can range from acceptable to nil. A person can approximate the correct measurements of sand, aggregate and cement getting an acceptable result, but not with foam. So much of light weight cement’s strength depends on the structure of the foam and you can’t necessarily tell that by looking at it. Definitely true. I know quite a bit about concrete with a degree in civil engineering. If the mix is off then the structural integrity can vary widely and even be dangerous. Is the equipment still available, I am in Puerto vallarta Mexico, and interested. I am contacting in regard to some postings you made on the Natural Building Blog back in Jan/16, regarding foamed cement. You mentioned you had some equipment and some supplies that you would be interested to selling If it is still available I would be very much interested. If not I would be very much interested in learning where you got your supplies and any other info you could pass on regarding the equipment and the process. you mentioned Tucson, if that’s where live, I’d just mention I am also in AZ. Hope to hear from you. I have the foamer here in New Mexico. The foam/metering machine is in Mexico and could not be brought back until December. I can send a quart of the foamer and instructions to you for $15 +shipping. You can do experimental batches using an electric drill with a brush to make the foam. A quart will make many yards of foam to experiment with. Check out the Litebuilt.com website to get an idea of foam concrete possibilities. Thanks for your response. Yes I would like to buy a quart from you. You cam PM me at jrtaylorinflag@gmail.com to arrange payment. Regarding Litebuilt, I have visited their webpage as well as many others. They do appear to be a large player in the CLC industry. In fact Foamed cement for construct appears to be used all over Europe and every other country in the world except the USA. Having been involved in construction in the past,I have my suspicions why. I have helped 2 person in this forum to buy foaming agent from UK and I have supplied a foam generator for one of them yesterday. We can supply complete plant for CLC production of capacity from 10m3/day to 250m3/day. I hope we can cooperate. The website you are referring to, made CLC blocks and then mortared them into a dome using a process of support similar to how the Romans built their structures. The machine makes CLC slurry with the lowest structural integrity without any aggregate. Typical concrete weighs 140-150 lbs. per cubic foot. That CLC weighs 50 lbs. per cubic foot. I need to make concrete with aggregate weighing around 105-120 lbs. per cubic foot. I tried to purchase it, and as indicated in a previous post their website was over seas and not secure. I was unwilling to risk my credit card number. I invite people to view the web site, http://www.monolithic.org/cabins. I am seeking to build these out of CLC. They are portable, but the largest weighs 14 US tons. If I can make them 20% lighter, it saves 3 US tons and a smaller crane can move them if needed. My plans though are to build them in place. My state, Kansas, doesn’t tax a business’ personal property, and these would qualify as personal property, so it would significantly reduce my costs and I could provide affordable housing to lower income individuals. At the web site, there is a You Tube video of Monolithic building these units. I have the mixer and shotcrete machine to build them. You batch mix the concrete in 1/4 to 1/3 a cubic yard and dump that in the shotcrete hopper for shooting on the inside of the building. For this reason, I don’t want a large volume foam machine. We will scoop the aggregate, break two cement bags into the mixer and mix the ingredients dry, before adding treated water. If instead I add foam to the desired consistency, we will get a tackier material with added insulation capabilities and a lighter product. I’m sorry, but you are mistaken. There are different grades of CLC. You are referring to the weakest mix that consists of cement, fly ash and foam, mixed in a slurry. There are different grades and mixes. I am referring to a concrete consisting of cement, aggregate and treated water. This mix may contain fly ash as well. If, instead of just treated water, I add foam, I get a concrete approaching the strength of normal concrete at 1/4 less weight. Your slurry mix isn’t intended to replace normal load bearing concrete. The concrete Monolithic uses had perlite added for air entrainment. The longer you mix the concrete the better it works because you entrain air through the mixing process. I am sure that I can create a CLC that can be pumped and shot with a weight reduction of about 20%. My training at Monolithic was for the most part to learn about how to make a,stackable, strong concrete that would produce a tornado proof structure. My sole problem is finding an affordable foam machine so I can batch mix the concrete. I have a foam machine which makes the foam which can be injected into a pumped water/sand/cement mix -made by Goodson Associates from colorado. Am interested in selling it and 50 gallons of foamer concentrate. Yes, I replied previously. I am interested. Please tell me about it, model, price and when you bring it back to the US, where it will be located. I have been working in shotcrete ( we are dealer of Aliva) since many years, but we never try to use CLC as shotcrete material before! We also have been in CLC industry since 1998 but never used it in shotcrete! This is the first time we hear about this! Strange? Anyway theoretically I think it is possible and I will try it some time! I hope you will share your experiences with me, if possible. Regarding your need of foaming machine for foam concrete, I can supply you a small unit which is compact and light (7kgs 04 15 pounds in weight) and can spray about 200 litters of foam per minutes. I also have other unit which has higher capacity ( 650l/min) if you want. Both are run only by compressed air and very safe to you in mobile jobs. Pls send me your email so that I can send you more details. Foam concrete strength and insulation can be varied by adding more or less foam to the mix. The cement amounts per cu yd are the same as normal concrete, so material costs are similar per yard minus sand and rock. A cu yd would still cost $60 – $70 for cement. A continuous mixer / pumper ( add cement, water, and foamer, would make it much easier to use. It is so light, it sticks in the mixer, and transport buckets. You can also mix the foam with sand only and make quicksand pits just like the movies. It is easy to mix small batches. Just whip up the 40-1 mix into a froth with a drill powered wire brush , mix a cement/water paste , and mix the two with a paddle. fire resistant door fill (better fire resistance, insulation, and lighter weight than standard gypsum fire doors. It can be pumped to fill gopher tunnels hundreds of feet long. Foam concrete feels cooler when hot and warmer when cold because it is less dense, like wood compared to steel. It does require better curing techniques than normal concrete because it takes longer to gain strength. I am experimenting with additives for more tensile strength and faster curing. You can’t add latex to the finished mix (kills the foam), but blending the foam into a latex additive/cement mix works. It doesn’t replace normal concrete, but I wish I had used it under my hot water heated concrete floor, and am happy I used it on the roof of my concrete Mexican house. If you want some foamer to make your own, it is very cheap. A gallon( $50) will make 12 cubic yards of foam to mix with your cement and water. My name is Thomas Langlade, I am an intern at CU Boulder (Colorado) and I study the foamed cement, a blend of cement, water, additivies like silica-fume or fly-ashes, and foam (made from foaming agents and water). There are no aggregates in this product. If you have such products, I will be interested in ordering some. Mike, Ive not heard of this one, but looks like a cool unit for a smaller batch…im in kc as well, and will post more as i experiment this summer, I know that there is a type of foam used in the well drilling industry that resists bubble collapse too. I found plans for a foamer on YouTube. It had a schematic and build layout. You would still need foaming agent, but was equal to the Green Dragon. I can only speak for myself, but I don’t trust giving someone in another country my CC number. Can you post the youtube link? When I previously replied I was doing it from my phone, so I couldn’t jump around and get what I needed easily. If you but search for foam generators, you’ll find a lot there. If you are making small batches, a rotary wire brush ( with an extension drive shaft) in a 110 v drill will whip up 5 gallons of stiff foam very quickly. You will find that it is more difficult to mix cement with water than to make foam and mix it into the paste. Please let me know if you ever find a continuous mix moarter machine. I had no luck with soap bubbles- mine don’t hold up . Don’t give up without trying commercial foaming agent. One thing most people ignore is curing (keeping it wet) the foam cement for at least a week. Cement needs time and water to become strong. Add 50g hydrogen peroxide (110 vol), 120g portland cement or ground granulated blast furnace slag, and 100g of water. The slurry should start to expand almost immediately and is hard after 3 hours at room temperature. Be careful, the binder will be quite caustic. Should make 860 g of foamed geoploymer, around 2.8 times more insulating than foamed concrete, and is supposed to allow water vapor transport for passive cooling. Haven’t actually tried it yet, but it’s in Davidovits’ geopolymer textbook. The foaming agent costs about $50/gallon in 55 gal drums. Cement used is the same amount as regular concrete, just the large stones are replaced with the cellular foam, so it is not cheap. Pumping it is almost necessary because it is so light and sticky it stays in buckets and wheelbarrows. Very interesting material, but requires different mixing and transport methods. I am building a diy squeeze pump and use a water reducer to easier mix the cement and water. My hope is to use the large cmc machine i have to “print” foam cement pieces. That cost hasn’t been confirmed as far as I know. Always check current prices. I bought it from Goodson and Associates in the Denver area with a foam generator. They use it to fill old mine shafts. The foam concrete is used for non structural walls and horizontal sub floors much more in other countries than the US. A contractor in ABQ. NM adds foam concrete to insulate and add pitch to flat roofs. Interesting subject this foamed concrete. Seems like we DIY’ers can’t just go down to home depot & buy a can of foaming agent aside from buying a bottle of dish soap from Safeway. Looks like a foam generator is needed in addition to the foaming agent to make this stuff. However,found one post on U Tube where the guy mixed a 2 part liquid in a bottle, transferred it to a bucket & mixed with drill paddle to make foam & put it in mixer by hand. Maybe I’ll try squirting a can of shaving cream into to mixer & see what happens. Shaving foam will collapse when you mix in concrete. Am I correct to assume you could use this material to spray inside and out of an earth bag building? If so, what are the prices compared to using just concrete? Yes, there are many uses. It’s a specialty product so the price is probably higher than regular cement. The higher price is a turn off right away. I find it interesting that products, food that are better for the earth or use less drugs seem to always cost more. Poultry and beef that do not use chemicals cost more. THAT has always confused me. It’s cheaper but healthier, pay more. It seems the same with this product. This specialty cement requires extra materials and processing, and so a higher price is reasonable. It’s less expensive to mass produce ordinary cement that’s used 99% of the time. So, it actually will be cheaper in the long run to use this product? And, will stand up to regular mortar longer? What’s the mix ratio per bag of cement and sand? You have go analyze it on a case by case basis. You may not even need it. Typical concrete works for 99% of applications. Search their website for details, think it over and then call their tech department if necessary. Thanks. I guess a little more research hunh?! Owen, do you happen to know the R-value of this product? Or the cost? One very interesting application is making sections of domes one at a time and assembling later. I saw an article that described the process about 20-30 years ago and can’t remember where I read it. If anyone knows the source, please let me know. The author used a simple form to make sections of a dome. 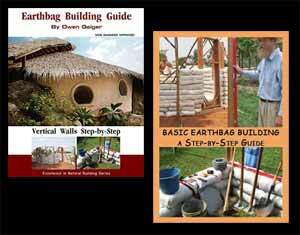 Another reader is planning to form entire domes and pump in the foamed concrete all at once to build instant houses.